When my good friend Candice was trying to lure me to Newfoundland this past summer she promised me icebergs, cod fishing, beers and wild puffins. I was sold. Before this trip I had never seen a real Puffin… scratch that, I had never seen a living Puffin… Before this trip I had only ever eaten puffin. I dined on this fishy chicken while traveling around Iceland in 2011 which you can see HERE (skip to 8:40). I was excited to finally get to see these cute and almost cuddly looking birds on our trip and the small town of Elliston on the East Coast of Newfoundland was the perfect place to see them. 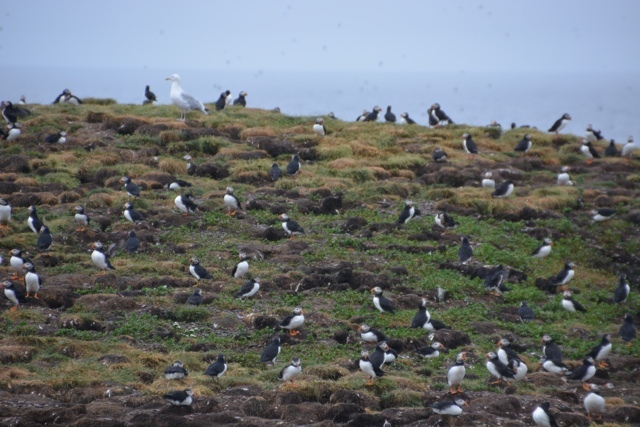 In fact Elliston is the closest place on land in North America that you can see nesting puffins. Elliston is also known as the Root Cellar capital of the world, it is home to a great memorial and museum for the sealers of Newfoundland and the 1914 Sealing disasters, as well as being home to a quirky puffin train. Currently home to 300 people Elliston was once an active fishing village, tourism seems to be the main business these days. 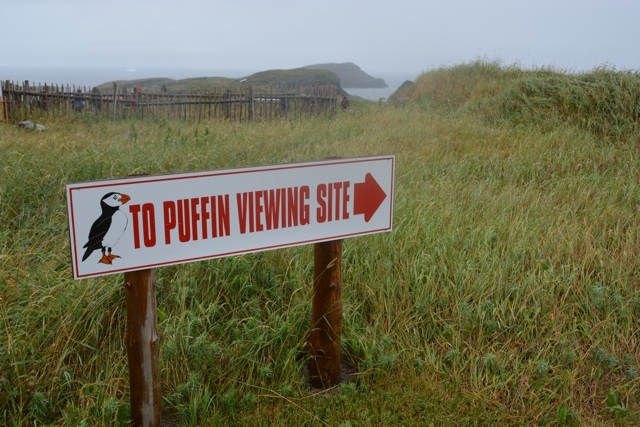 To see the puffins in Elliston visit the “Puffin Viewing Site” between May and September. Located a short 5 minute walk from the road there is free entrance to the viewing site however donations are kindly accepted. Once you reach the end of the point across a small tickle is another large rock where you can spot hundreds of this cute little birds waddling around and wobbly flying through the sky. If you are lucky you will arrive when there aren’t many other people around. 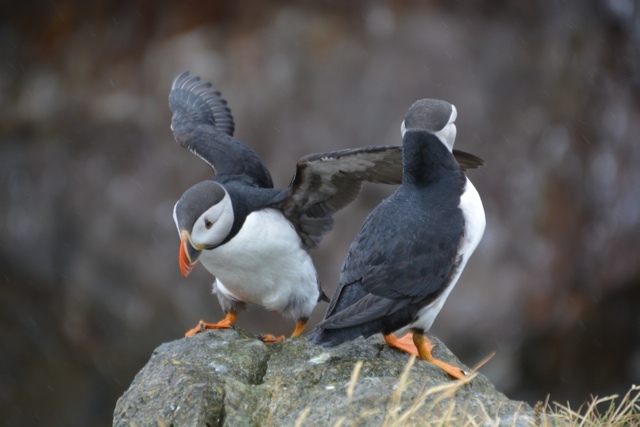 Stand still and cross your fingers and there is a good chance that a few brave and curious puffins will fly over to the mainland near you in search of grass for their nests or just to hang out and pose for your camera. Rain or shine the puffins are always around to greet you. To learn more about these adorable tasty little guys watch my newest video. Special thanks to the Legendary Coasts of Eastern Newfoundland for helping us plan our road trip. 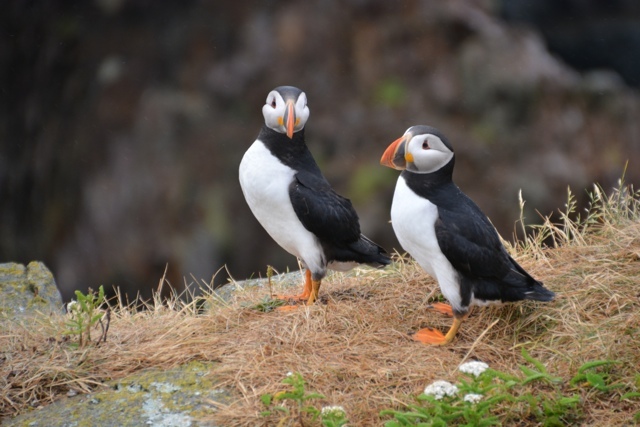 Such cute birds … I heard some Newfoundlanders (or is it Ice/Greenlanders?) 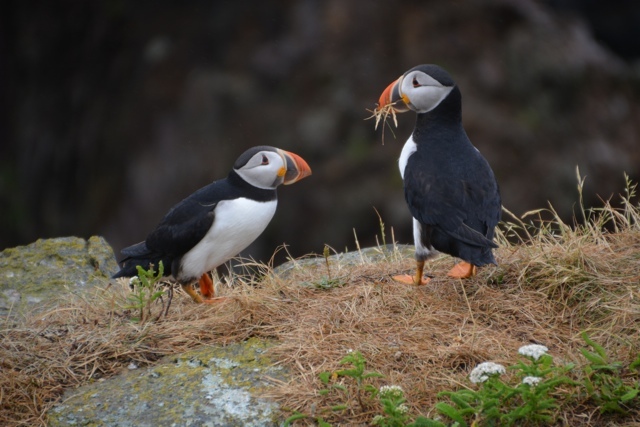 actually eat puffin …. I could never bring myself to do that! Cute little Puffins! They are so adorable! I love this! They are such wonderful little butterballs.